A semiconductor is a solid whose electrical conductivity can be controlled over a wide range, either permanently or dynamically. Semiconductors are tremendously important technologically and economically. Semiconductors are essential materials in all modern electrical devices, from computers to cellular phones to digital audio players. Silicon is the most commercially important semiconductor, though dozens of others are important as well. Semiconductor devices are electronic components that exploit the electronic properties of semiconductor materials, principally silicon, germanium, and gallium arsenide. Semiconductor devices have replaced thermionic devices (vacuum tubes) in most applications. They use electronic conduction in the solid state as opposed to the gaseous state or thermionic emission in a high vacuum. 2.6 Origin of the term "transistor"
Semiconductor devices are manufactured as single, discrete devices or integrated circuits (ICs), which consist of a number—from a few devices to millions—of devices manufactured onto a single semiconductor substrate. Semiconductors are very similar to insulators. The two categories of solids differ primarily in that insulators have larger band gaps—energies that electrons must acquire to be free to flow. In semiconductors at room temperature, just as in insulators, very few electrons gain enough thermal energy to leap the band gap, which is necessary for conduction. For this reason, pure semiconductors and insulators, in the absence of applied fields, have roughly similar electrical properties. The smaller bandgaps of semiconductors, however, allow for many other means besides temperature to control their electrical properties. Semiconductors' intrinsic electrical properties are very often permanently modified by introducing impurities, in a process known as doping. Usually it is reasonable to approximate that each impurity atom adds one electron or one "hole" (a concept to be discussed later) that may flow freely. Upon the addition of a sufficiently large proportion of dopants, semiconductors conduct electricity nearly as well as metals. The junctions between regions of semiconductors that are doped with different impurities contain built-in electric fields, which are critical to semiconductor device operation. In addition to permanent modification through doping, the electrical properties of semiconductors are often dynamically modified by applying electric fields. The ability to control conductivity in small and well-defined regions of semiconductor material, statically through doping and dynamically through the application of electric fields, has led to the development of a broad array of semiconductor devices, like transistors. Semiconductor devices with dynamically controlled conductivity are the building blocks of integrated circuits, like the microprocessor. These "active" semiconductor devices are combined with simpler passive components, such as semiconductor capacitors and resistors, to produce a variety of electronic devices. In certain semiconductors, when electrons fall from the conduction band to the valence band (the energy levels above and below the band gap), they often emit light. This photoemission process underlies the light-emitting diode (LED) and the semiconductor laser, both of which are tremendously important commercially. Conversely, semiconductor absorption of light in photodetectors excites electrons from the valence band to the conduction band, facilitating reception of fiber optic communications, and providing the basis for energy from solar cells. Semiconductors may be elemental materials, such as silicon, compound semiconductors such as gallium arsenide, or alloys, such as silicon germanium or aluminium gallium arsenide. Semiconductors had been used in the electronics field for some time before the invention of the transistor. Around the turn of the twentieth century they were quite common as detectors in radios, used in a device called a "cat's whisker." These detectors were somewhat troublesome, however, requiring the operator to move a small tungsten filament (the whisker) around the surface of a galena (lead sulfide) or carborundum (silicon carbide) crystal until it suddenly started working. Then, over a period of a few hours or days, the cat's whisker would slowly stop working and the process would have to be repeated. At the time their operation was completely mysterious. After the introduction of the more reliable and amplified vacuum tube based radios, the cat's whisker systems quickly disappeared. The "cat's whisker" is a primitive example of a special type of diode still popular today, called a Schottky diode. During World War II, radar research quickly pushed radar receivers to operate at ever higher frequencies and the traditional tube based radio receivers no longer worked well. The introduction of the cavity magnetron from Britain to the United States in 1940 during the Tizzard Mission resulted in a pressing need for a practical high-frequency amplifier. On a whim, Russell Ohl of Bell Laboratories decided to try a cat's whisker. By this point they had not been in use for a number of years, and no one at the labs had one. After hunting one down at a used radio store in Manhattan, he found that it worked much better than tube-based systems. Ohl investigated why the cat's whisker functioned so well. He spent most of 1939 trying to grow more pure versions of the crystals. He soon found that with higher quality crystals their finicky behavior went away, but so did their ability to operate as a radio detector. One day he found one of his purest crystals nevertheless worked well, and interestingly, it had a clearly visible crack near the middle. However as he moved about the room trying to test it, the detector would mysteriously work, and then stop again. After some study he found that the behaviour was controlled by the light in the room–more light caused more conductance in the crystal. He invited several other people to see this crystal, and Walter Brattain immediately realized there was some sort of junction at the crack. Further research cleared up the remaining mystery. The crystal had cracked because either side contained very slightly different amounts of the impurities Ohl could not remove–about 0.2 percent. One side of the crystal had impurities that added extra electrons (the carriers of electrical current) and made it a "conductor." The other had impurities that wanted to bind to these electrons, making it (what he called) an "insulator." Because the two parts of the crystal were in contact with each other, the electrons could be pushed out of the conductive side which had extra electrons (soon to be known as the emitter) and replaced by new ones being provided (from a battery, for instance) where they would flow into the insulating portion and be collected by the whisker filament (named the collector). However, when the voltage was reversed the electrons being pushed into the collector would quickly fill up the "holes" (the electron-needy impurities), and conduction would stop almost instantly. This junction of the two crystals (or parts of one crystal) created a solid-state diode, and the concept soon became known as semiconduction. The mechanism of action when the diode is off has to do with the separation of charge carriers around the junction. This is called a "depletion region." Armed with the knowledge of how these new diodes worked, a vigorous effort began in order to learn how to build them on demand. Teams at Purdue University, Bell Labs, MIT, and the University of Chicago all joined forces to build better crystals. Within a year germanium production had been perfected to the point where military-grade diodes were being used in most radar sets. After the war, William Shockley decided to attempt the building of a triode-like semiconductor device. He secured funding and lab space, and went to work on the problem with Brattain and John Bardeen. The key to the development of the transistor was the further understanding of the process of the electron mobility in a semiconductor. It was realized that if there was some way to control the flow of the electrons from the emitter to the collector of this newly discovered diode, one could build an amplifier. For instance, if you placed contacts on either side of a single type of crystal the current would not flow through it. However if a third contact could then "inject" electrons or holes into the material, the current would flow. Actually doing this appeared to be very difficult. If the crystal were of any reasonable size, the number of electrons (or holes) required to be injected would have to be very large-–making it less than useful as an amplifier because it would require a large injection current to start with. That said, the whole idea of the crystal diode was that the crystal itself could provide the electrons over a very small distance, the depletion region. The key appeared to be to place the input and output contacts very close together on the surface of the crystal on either side of this region. Brattain started working on building such a device, and tantalizing hints of amplification continued to appear as the team worked on the problem. Sometimes the system would work but then stop working unexpectedly. In one instance a non-working system started working when placed in water. Ohl and Brattain eventually developed a new branch of quantum mechanics known as surface physics to account for the behavior. The electrons in any one piece of the crystal would migrate about due to nearby charges. Electrons in the emitters, or the "holes" in the collectors, would cluster at the surface of the crystal where they could find their opposite charge "floating around" in the air (or water). Yet they could be pushed away from the surface with the application of a small amount of charge from any other location on the crystal. Instead of needing a large supply of injected electrons, a very small number in the right place on the crystal would accomplish the same thing. Their understanding solved the problem of needing a very small control area to some degree. Instead of needing two separate semiconductors connected by a common, but tiny, region, a single larger surface would serve. The emitter and collector leads would both be placed very close together on the top, with the control lead placed on the base of the crystal. When current was applied to the "base" lead, the electrons or holes would be pushed out, across the block of semiconductor, and collect on the far surface. As long as the emitter and collector were very close together, this should allow enough electrons or holes between them to allow conduction to start. A stylized replica of the first transistor invented at Bell Labs in 1947. The Bell team made many attempts to build such a system with various tools, but generally failed. Setups where the contacts were close enough were invariably as fragile as the original cat's whisker detectors had been, and would work briefly, if at all. Eventually they had a practical breakthrough. A piece of gold foil was glued to the edge of a plastic wedge, and then the foil was sliced with a razor at the tip of the triangle. The result was two very closely spaced contacts of gold. When the plastic was pushed down onto the surface of a crystal and voltage applied to the other side (on the base of the crystal), current started to flow from one contact to the other as the base voltage pushed the electrons away from the base towards the other side near the contacts. The point-contact transistor had been invented. 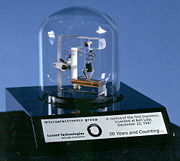 While the device was constructed a week earlier, Brattain's notes describe the first demonstration to higher-ups at Bell Labs on the afternoon of December 23, 1947, often given as the birth date of the transistor. The "PNP point-contact germanium transistor" operated as a speech amplifier with a power gain of 18 in that trial. Known generally as a point-contact transistor today, John Bardeen, Walter Houser Brattain, and William Bradford Shockley were awarded the Nobel Prize in physics for their work in 1956. Origin of the term "transistor"
Transistor. This is an abbreviated combination of the words "transconductance" or "transfer," and "varistor." The device logically belongs in the varistor family, and has the transconductance or transfer impedance of a device having gain, so that this combination is descriptive. Shockley was upset about the device being credited to Brattain and Bardeen, who he felt had built it "behind his back" to take the glory. Matters became worse when Bell Labs lawyers found that some of Shockley's own writings on the transistor were close enough to those of an earlier 1925 patent by Julius Edgar Lilienfeld that they thought it best that his name be left off the patent application. Shockley was incensed, and decided to demonstrate who was the real brains of the operation. Only a few months later he invented an entirely new type of transistor with a layer or 'sandwich' structure. This new form was considerably more robust than the fragile point-contact system, and would go on to be used for the vast majority of all transistors into the 1960s. It would evolve into the bipolar junction transistor. With the fragility problems solved, a remaining problem was purity. Making germanium of the required purity was proving to be a serious problem, and limited the number of transistors that actually worked from a given batch of material. Germanium's sensitivity to temperature also limited its usefulness. Scientists theorized that silicon would be easier to fabricate, but few bothered to investigate this possibility. Gordon Teal was the first to develop a working silicon transistor, and his company, the nascent Texas Instruments, profited from its technological edge. Germanium disappeared from most transistors by the late 1960s. Within a few years, transistor-based products, most notably radios, were appearing on the market. A major improvement in manufacturing yield came when a chemist advised the companies fabricating semiconductors to use distilled water rather than tap water: calcium ions were the cause of the poor yields. "Zone melting," a technique using a moving band of molten material through the crystal, further increased the purity of the available crystals. By far, silicon (Si) is the most widely used material in semiconductor devices. Its combination of low raw material cost, relatively simple processing, and a useful temperature range make it currently the best compromise among the various competing materials. Silicon used in semiconductor device manufacturing is currently fabricated into boules that are large enough in diameter to allow the production of 300 mm (12 in.) wafers. Germanium (Ge) was a widely used early semiconductor material but its thermal sensitivity makes it less useful than silicon. Today, germanium is often alloyed with silicon for use in very-high-speed SiGe devices; IBM is a major producer of such devices. Gallium arsenide (GaAs) is also widely used in high-speed devices but so far, it has been difficult to form large-diameter boules of this material, limiting the wafer diameter to sizes significantly smaller than silicon wafers thus making mass production of GaAs devices significantly more expensive than silicon. Other less common materials are also in use or under investigation. Silicon carbide (SiC) has found some application as the raw material for blue light-emitting diodes (LEDs) and is being investigated for use in semiconductor devices that could withstand very high operating temperatures and environments with the presence of significant levels of ionizing radiation. IMPATT diodes have also been fabricated from SiC. Various indium compounds (indium arsenide, indium antimonide, and indium phosphide) are also being used in LEDs and solid state laser diodes. Selenium sulfide is being studied in the manufacture of photovoltaic solar cells. Semiconductors with predictable, reliable electronic properties are necessary for mass production. The level of chemical purity needed is extremely high because the presence of impurities even in very small proportions can have large effects on the properties of the material. A high degree of crystalline perfection is also required, since faults in crystal structure (such as dislocations, twins, and stacking faults) interfere with the semiconducting properties of the material. Crystalline faults are a major cause of defective semiconductor devices. The larger the crystal, the more difficult it is to achieve the necessary perfection. Current mass production processes use crystal ingots between four and twelve inches (300 mm) in diameter which are grown as cylinders and sliced into wafers. Because of the required level of chemical purity, and the perfection of the crystal structure which are needed to make semiconductor devices, special methods have been developed to produce the initial semiconductor material. A technique for achieving high purity includes growing the crystal using the Czochralski process. An additional step that can be used to further increase purity is known as zone refining. In zone refining, part of a solid crystal is melted. The impurities tend to concentrate in the melted region, while the desired material recrystalizes leaving the solid material more pure and with fewer crystalline faults. In manufacturing semiconductor devices involving heterojunctions between different semiconductor materials, the lattice constant, which is the length of the repeating element of the crystal structure, is important for determining the compatibility of materials. The main reason semiconductor materials are so useful is that the behaviour of a semiconductor can be easily manipulated by the addition of impurities, known as doping. Semiconductor conductivity can be controlled by introduction of an electric field, by exposure to light, and even pressure and heat; thus, semiconductors can make excellent sensors. Current conduction in a semiconductor occurs via mobile or "free" electrons and holes (collectively known as charge carriers). Doping a semiconductor such as silicon with a small amount of impurity atoms, such as phosphorus or boron, greatly increases the number of free electrons or holes within the semiconductor. When a doped semiconductor contains excess holes it is called "p-type," and when it contains excess free electrons it is known as "n-type." The semiconductor material used in devices is doped under highly controlled conditions in a fabrication facility, or fab, to precisely control the location and concentration of p- and n-type dopants. The junctions which form where n-type and p-type semiconductors join together are called p-n junctions. The p-n junction diode is a device made from a p-n junction. At the junction of a p-type and an n-type semiconductor there forms a region called the depletion zone which blocks current conduction from the n-type region to the p-type region, but allows current to conduct from the p-type region to the n-type region. Thus when the device is forward biased, with the p-side at higher electric potential, the diode conducts current easily; but the current is very small when the diode is reverse biased. Exposing a semiconductor to light can generate electron–hole pairs, which increases the number of free carriers and its conductivity. Diodes optimized to take advantage of this phenomenon are known as photodiodes. Compound semiconductor diodes can also be used to generate light, as in light-emitting diodes and laser diodes. Two MOS transistors with common gate (metallic layers and dielectric removed for clarity). Bipolar junction transistors are formed from two p-n junctions, in either n-p-n or p-n-p configuration. The middle, or base, region between the junctions is typically very narrow. The other regions, and their associated terminals, are known as the emitter and the collector. A small current injected through the junction between the base and the emitter changes the properties of the base-collector junction so that it can conduct current even though it is reverse biased. This creates a much larger current between the collector and emitter, controlled by the base-emitter current. Another type of transistor, the field effect transistor operates on the principle that semiconductor conductivity can be increased or decreased by the presence of an electric field. An electric field can increase the number of free electrons and holes in a semiconductor, thereby changing its conductivity. The field may be applied by a reverse-biased p-n junction, forming a junction field effect transistor, or JFET; or by an electrode isolated from the bulk material by an oxide layer, forming a metal-oxide-semiconductor field effect transistor, or MOSFET. Cross-section through a MOS transistor (metallic layers and dielectric removed for clarity), foreground. The MOSFET is the most used semiconductor device today. The gate electrode is charged to produce an electric field that controls the conductivity of a "channel" between two terminals, called the source and drain. Depending on the type of carrier in the channel, the device may be an n-channel (for electrons) or a p-channel (for holes) MOSFET. Although the MOSFET is named in part for its "metal" gate, in modern devices polysilicon is typically used instead. All transistor types can be used as the building blocks of logic gates, which are fundamental in the design of digital circuits. In digital circuits like microprocessors, transistors act as on-off switches; in the MOSFET, for instance, the voltage applied to the gate determines whether the switch is on or off. Transistors used for analog circuits do not act as on-off switches; rather, they respond to a continuous range of inputs with a continuous range of outputs. Common analog circuits include amplifiers and oscillators. Circuits that interface or translate between digital circuits and analog circuits are known as mixed-signal circuits. Power semiconductor devices are discrete devices or integrated circuits intended for high current or high voltage applications. Power integrated circuits combine IC technology with power semiconductor technology, these are sometimes referred to as "smart" power devices. Several companies specialize in manufacturing power semiconductors. The type designators of semiconductor devices are often manufacturer specific. Nevertheless, there have been attempts at creating standards for type codes, and a subset of devices follow those. For discrete devices, for example, there are three standards: JEDEC JESD370B in USA, Pro Electron in Europe and JIS in Japan. 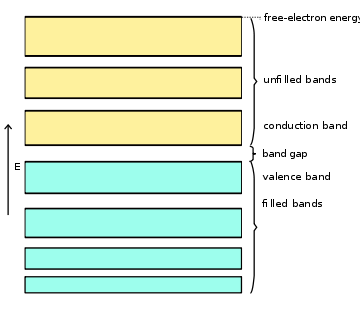 Band structure of a semiconductor showing a full valence band and an empty conduction band. Like other solids, the electrons in semiconductors can have energies only within certain bands between the energy of the ground state, corresponding to electrons tightly bound to the atomic nuclei of the material, and the free electron energy, which is the energy required for an electron to escape entirely from the material. The energy bands each correspond to a large number of discrete quantum states of the electrons, and most of the states with low energy are full, up to a particular band called the valence band. Semiconductors and insulators are distinguished from metals because the valence band in the former materials is very nearly full under normal conditions. The ease with which electrons in a semiconductor can be excited from the valence band to the conduction band depends on the band gap between the bands, and it is the size of this energy bandgap that serves as an arbitrary dividing line (roughly 4 eV) between semiconductors and insulators. The electrons must move between states to conduct electric current, and so due to the Pauli exclusion principle full bands do not contribute to the electrical conductivity. However, as the temperature of a semiconductor rises above absolute zero, the states of the electrons are increasingly randomized, or smeared out, and some electrons are likely to be found in states of the conduction band, which is the band immediately above the valence band. The current-carrying electrons in the conduction band are known as "free electrons," although they are often simply called "electrons" if context allows this usage to be clear. Electrons excited to the conduction band also leave behind electron holes, or unoccupied states in the valence band. Both the conduction band electrons and the valence band holes contribute to electrical conductivity. The holes themselves don't actually move, but a neighboring electron can move to fill the hole, leaving a hole at the place it has just come from, and in this way the holes appear to move, and the holes behave as if they were actual positively charged particles. This behavior may also be viewed in relation to chemical bonding. The electrons that have enough energy to be in the conduction band have broken free of the covalent bonds between neighboring atoms in the solid, and are free to move around, and hence conduct charge. It is an important distinction between conductors and semiconductors that, in semiconductors, movement of charge (current) is facilitated by both electrons and holes. Contrast this to a conductor where the Fermi level lies within the conduction band, such that the band is only half filled with electrons. In this case, only a small amount of energy is needed for the electrons to find other unoccupied states to move into, and hence for current to flow. When ionizing radiation strikes a semiconductor, it may excite an electron out of its energy level and consequently leave a hole. This process is known as electron–hole pair generation. Electron-hole pairs are constantly generated from thermal energy as well, in the absence of any external energy source. Electron-hole pairs are also apt to recombine. Conservation of energy demands that these recombination events, in which an electron loses an amount of energy larger than the band gap, be accompanied by the emission of thermal energy (in the form of phonons) or radiation (in the form of photons). The property of semiconductors that makes them most useful for constructing electronic devices is that their conductivity may easily be modified by introducing impurities into their crystal lattice. The process of adding controlled impurities to a semiconductor is known as doping. The amount of impurity, or dopant, added to an intrinsic (pure) semiconductor varies its level of conductivity. Doped semiconductors are often refered to as extrinsic. The materials chosen as suitable dopants depend on the atomic properties of both the dopant and the material to be doped. In general, dopants that produce the desired controlled changes are classified as either electron acceptors or donors. A donor atom that activates (that is, becomes incorporated into the crystal lattice) donates weakly-bound valence electrons to the material, creating excess negative charge carriers. These weakly-bound electrons can move about in the crystal lattice relatively freely and can facilitate conduction in the presence of an electric field. Conversely, an activated acceptor produces a hole. Semiconductors doped with donor impurities are called n-type, while those doped with acceptor impurities are known as p-type. The n and p type designations indicate which charge carrier acts as the material's majority carrier. The opposite carrier is called the minority carrier, which exists due to thermal excitation at a much lower concentration compared to the majority carrier. For example, the pure semiconductor silicon has four valence electrons. In silicon, the most common dopants are IUPAC group 13 (commonly known as column III) and group 15 (commonly known as column V) elements. Group 13 elements all contain three valence electrons, causing them to function as acceptors when used to dope silicon. Group 15 elements have five valence electrons, which allows them to act as a donor. Therefore, a silicon crystal doped with boron creates a p-type semiconductor whereas one doped with phosphorus results in an n-type material. Where is the concentration of conducting electrons, is the electron hole concentration, and is the material's intrinsic carrier concentration. Intrinsic carrier concentration varies between materials and is dependent on temperature. Silicon's , for example, is roughly 1×1010 cm-3 at 300 kelvins (room temperature). In general, an increase in doping concentration affords an increase in conductivity due to the higher concentration of carriers available for conduction. Degenerately (very highly) doped semiconductors have conductivity levels comparable to metals and are often used in modern integrated circuits as a replacement for metal. Often superscript plus and minus symbols are used to denote relative doping concentration in semiconductors. For example, denotes an n-type semiconductor with a high, often degenerate, doping concentration. Similarly, would indicate a very lightly doped p-type material. It is useful to note that even degenerate levels of doping imply low concentrations of impurities with respect to the base semiconductor. In crystalline intrinsic silicon, there are approximately 5×1022 atoms/cm³. Doping concentration for silicon semiconductors may range anywhere from 1013 cm-3 to 1018 cm-3. Doping concentration above about 1018 cm-3 is considered degenerate at room temperature. Degenerately doped silicon contains a proportion of impurity to silicon in the order of parts per thousand. This proportion may be reduced to parts per billion in very lightly doped silicon. Typical concentration values fall somewhere in this range and are tailored to produce the desired properties in the device that the semiconductor is intended for. Band diagram of a p+n junction. The band bending is a result of the positioning of the Fermi levels in the p+ and n sides. Doping a semiconductor crystal introduces allowed energy states within the band gap but very close to the energy band that corresponds with the dopant type. In other words, donor impurities create states near the conduction band while acceptors create states near the valence band. The gap between these energy states and the nearest energy band is usually referred to as dopant-site bonding energy or and is relatively small. For example, the for boron in silicon bulk is 0.045 eV, compared with silicon's band gap of about 1.12 eV. Because is so small, it takes little energy to ionize the dopant atoms and create free carriers in the conduction or valence bands. Usually the thermal energy available at room temperature is sufficient to ionize most of the dopant. Dopants also have the important effect of shifting the material's Fermi level towards the energy band that corresponds with the dopant with the greatest concentration. Since the Fermi level must remain constant in a system in thermodynamic equilibrium, stacking layers of materials with different properties leads to many useful electrical properties. For example, the p-n junction's properties are due to the energy band bending that happens as a result of lining up the Fermi levels in contacting regions of p-type and n-type material. This effect is shown in a band diagram. The band diagram typically indicates the variation in the valence band and conduction band edges versus some spatial dimension, often denoted x. The Fermi energy is also usually indicated in the diagram. Sometimes the intrinsic Fermi energy, Ei, which is the Fermi level in the absence of doping, is shown. These diagrams are useful in explaining the operation of many kinds of semiconductor devices. The following are some examples of semiconductor devices. All links retrieved September 4, 2015. Hall of Fame, Glossary – Semiconductor OneSource. This page was last modified on 4 September 2015, at 16:31.